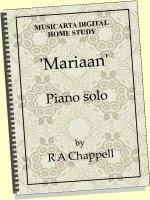 Musicarta piano solo home-study digital downloads are an excellent way to get contemporary keyboard pieces into your repertoire quickly and easily. These exciting modern pieces are available nowhere else! ‘Try before you buy’ using the video/audio preview players. Some of these pieces have individual web pages with additional background and teaching notes – see links beneath entries. Stop press! First Musicarta Solos album now out! Musicarta home study downloads are hosted by E-junkie, market leaders in the sector. You can buy with complete confidence – click down for details. Musicarta is dedicated to teaching musical creativity at the keyboard through a combination of usable music theory, easily understood keyboard textures (chord-tone patterns) and coached modern syncopation skills. The eleven pieces in Musicarta Piano Solos Volume 1 spring directly from this approach. 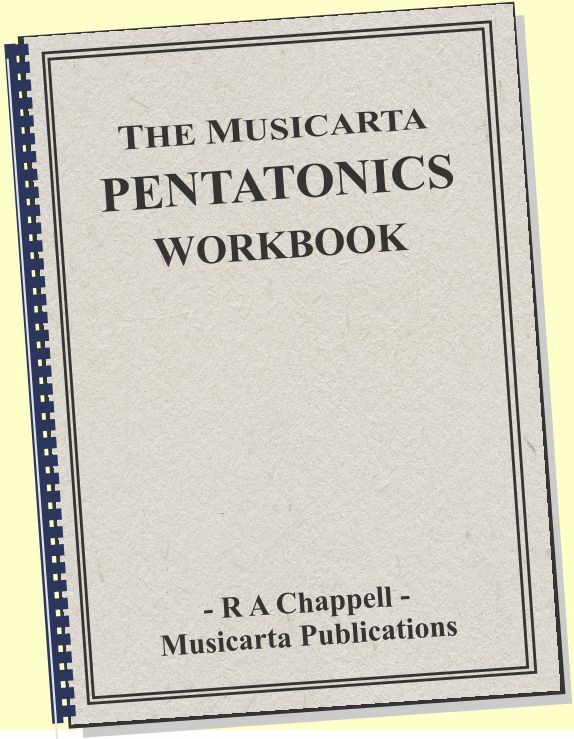 Some of the pieces are taken directly from Musicarta’s three major home-study programmes (The Pyramids Variations, the Canon Project and Key Chords Vol. 1); all are keyboard compositions which embody and illustrate the three principles outlined above. 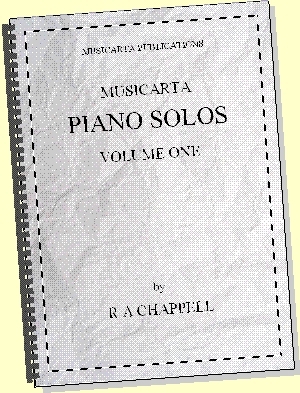 The digital download of Piano Solos Vol.1 comprises a 50-page PDF album/work-book, along with audio tracks of the compositions and MIDI files of the volume entries with the MidiPiano virtual keyboard (Windows OS) to play them on. Each solo has a couple of pages of notes explaining how the music is put together and offering useful practicing advice. Level ranges from easy-intermediate to intermediate-advanced. 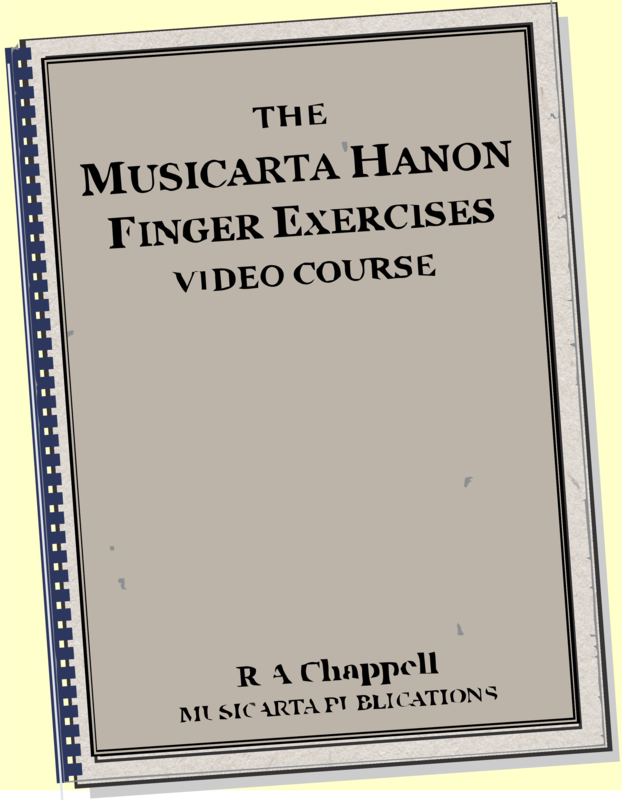 In addition, most of the entries have video counterparts on the MisterMusicarta YouTube channel, so learners can watch a performance and get an overall view of the hand patterning they are aiming for. Taken together, these three parallel additional resources offer even elementary readers a good chance of learning these solos. These exciting modern pieces are available nowhere else! ‘Try before you buy’ using the video/audio preview players. Some of these pieces have individual web pages with additional background and teaching notes – see links beneath individual entries. 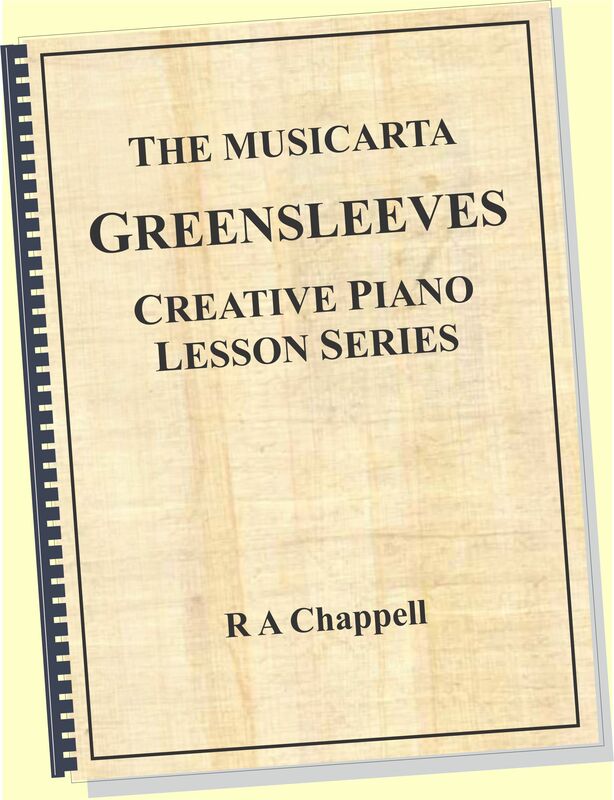 The first two pieces in the collection come from Musicarta’s Pyramids Variations series of keyboard creativity lessons. The music you make in Pyramids is generated from a keyboard ‘basic music-nuking position’ (see the illustration on the series home page), which offers a no-fuss way of playing (and playing around with!) a chord sequence. This first version has added melody notes to a simple sixteen-bar chord sequence. The second version of Pyramids has been extended to 32-bar length with the addition of some new B-section chords, and the melody developed with the squeezing-in of an in-between note and a rhythmic ‘tweak’. These two stages of the build-up to the Pyramids ‘Concert Performance’ demonstrate a process of composing at the keyboard, and illustrate how developing simple basic material can get you further, faster. This lyrical piece recycles the Pyramids chord sequence in a different time signature, and originally appeared as a ‘Pyramids Diary’ (ongoing exploration) entry on Mister Musicarta YouTube. Harmonic developments include slash chords, added chord tones and suspensions, while the broken-chord left hand offers another model for playing the underlying chords of any composition or improvisation. Longing picks up the Sad Parting suspensions theme. Suspensions (playing non-chord tones on the beat) are an excellent way of adding emotion to a piece – as the tile suggests – and of just getting more out of any chord sequence. Learning methodically is the theme of the supporting study notes, and the suspensions are fully marked up in the MS so you learn as you play. 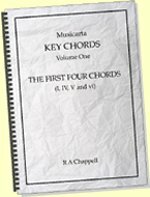 Harmonically, the piece is built on chords One, Four, Five and Six (I, IV, V, vi in the Roman numeral ‘chords in any key’ system) – the four chords you most need to know to play popular music fluently. 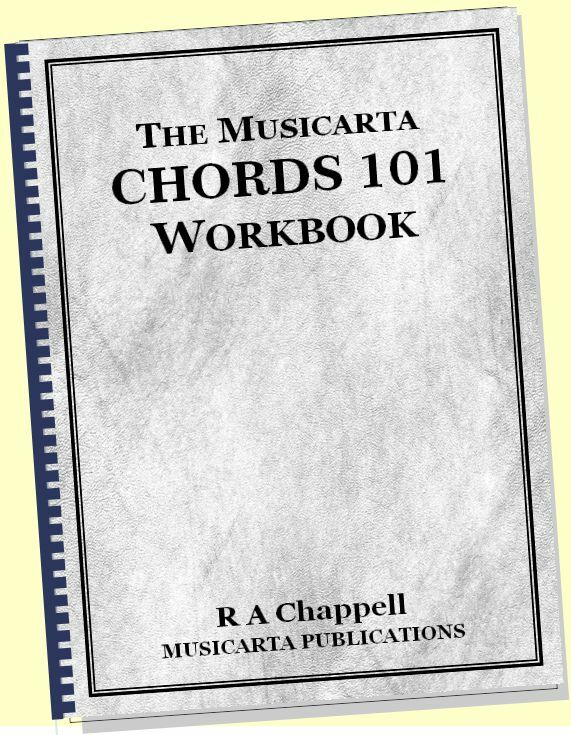 The Scene Changes, like A Sad Parting, is built on chords I, IV, V and vi – the four chords you’re most likely to come across in any piece of Western pop or classical music, and the focus of Musicarta’s Key Chords Volume One digital home study download, which offers a methodical approach to building your creative chord vocabulary. The Scene Changes moves out of all-white-key territory into the key of B flat, and the study notes introduce Musicarta’s inversion symbols and voice movement diagrams, two indispensable ways of mastering long strings of triads. You are browsing the first lines of Musicarta Piano Solos Volume 1 – a collection of eleven piano solos from Musicarta which offers an excellent opportunity to master quality modern piano-playing and improve your understanding of composition and improvisation techniques. Each solo has a couple of pages of notes explaining how the music is put together and offering useful practicing advice. The digital download of Piano Solos Volume 1 includes audio tracks of the compositions and MIDI files of the volume entries with the MidiPiano virtual keyboard (Windows OS) to play them on. Along with the performance videos on the MisterMusicarta YouTube channel, these resources offer even elementary readers a great chance to these attractive modern solos. The Cowboy Roll is a ‘12-bar’ – an example of the musical form that underpins a vast amount of Western popular music, from straight blues and boogie-woogie through rock’n’roll and thousands of pop songs and on to heavy metal. 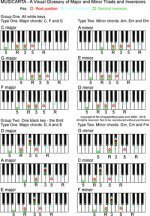 Understanding the 12-bar form is essential for the modern popular-styles keyboard player. The Cowboy Roll also introduces ‘swing quavers’ – the loping-along rhythm that passed from the blues into much of jazz and blues-influenced pop instrumental music. The study notes include detailed exercises for tackling that tricky syncopation – which always takes a few goes to get right! Southern Comfort continues the ‘swing quaver’ feel, and illustrates how you can make music from just a simple triad by taking the third (chord tone) up an octave to make a ‘tenth’. The third, its inversion the sixth and the tenth are the sweetest pairs of notes (intervals) on the keyboard, and if you’re just ‘doodling’, these are the pairs to aim for. ‘Walking tenths’ – pairs of these notes progressing in parallel up and down – form the basis of lots of pleasant, simple music. Teaching notes again help identify and learn the ‘skeleton music’ the piece is based on – a key element of creative music-making. As you can see in the first line of music (above) Ever True is also based on the ‘triad in open position’ used in Southern Comfort (with the third above the root and fifth), but adds the octave to make a four-note basis for your improvisations and compositions. Ever True is the first ‘modal’ piece in this volume of solos – its three chords A minor, G and F majors come from a set of chords called the Aeolian mode. Modes are an old key system still used in folk music, some pop, and in funk jazz. Ever True has a three-part ABA structure. The left hand gets more difficult in the middle section, but you can easily skip that part if you need to and still have a playable smaller-scale solo. The root-fifth-octave left hand is plain to see in the first-line excerpt of this little piece. The Next Day features another common pop-classical device: three rotating right hand notes over a four-note left hand pattern. The added non-chord tone is the ninth (second), the scale tone most likely to be added to the three usual chord tones in modern popular-classical (‘New Age’) music. The main chord sequence is circle-of-fifths construction, the next level of harmonic sophistication up from the now-familiar I–vi–IV–V chord grouping, while the middle section of the ABA form features a walking tenths device similar to those in previous pieces. 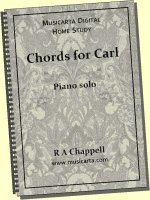 Chords for Carl is an example of Musicarta’s signature ‘left-hand-over’ style. The right hand plays a melody and the accompanying broken chord, while the left hand plays the bass note and a left-hand-over note to fill out the harmony – and for show! Other Musicarta left-hand-over pieces include Mariaan and Plaisir D’Amour (available as a free download - watch the video) and the style is showcased on a Mister Musicarta YouTube playlist. Mariaan and Chords for Carl are both available as thorough-going teach-yourself downloads to help you master this impressive and versatile keyboard texture. Piano Solos Volume 1 is a collection of eleven solos from across the Musicarta spectrum. Each solo has brief notes explaining how the music is put together and offering useful practicing advice. Level: easy-intermediate to intermediated-advanced. Comes with audio and MIDI supporting files of all pieces and MidiPiano (Windows OS) Virtual keyboard MIDI player. 50pp (25 pp MS) A4 – will print to US Letter also. Latest solo release - and it's a giveaway! Musicarta’s broken-chord-with-a-LH-over-note pattern is a versatile off-the-shelf way of playing chords. The full Chords for Carl and Mariaan teach-yourself packages cover the ground in detail (‘lite’ solos also available) – now this beautiful old favourite gets the treatment.